Comments: Created by Stan Weston. Originally released as an action figure who changed costumes to match various well known superheroes, including Batman, Superman, Spider-Man, Buck Rogers, Lone Ranger, Tonto, Flash Gordon, the Phantom, Captain America, Sergeant Fury, Steve Canyon, Aquaman and Green Hornet, in 1968 DC published 5 issues of a Captain Action comic, bringing him into their universe to meet Superman, and providing him with an origin and secret identity. However, soon after the comic launched, the toy was discontinued. 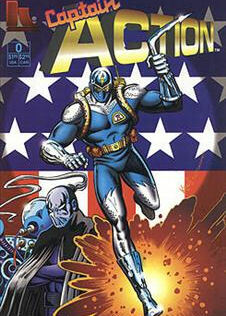 In 1987 Lightning Comics published ACTION Force #1, featuring Captain Action alongside other heroes. A couple of years later the writer of that one-shot penned some additional tales of Captain Action which appeared in Toy Collectors' Journal #1-3. In 1995 Karl Art Publishing tried to revive the character, including a Captain Action #0 insert comic inside another of their comics, Space Bananas #0, and featuring a massively revamped look for the character. The promised ongoing title never materialized. In 1998 Playing Mantis launched a new line of Captain Action toys, though the line was discontinued in 2000. In 2005 lifelong Captain Action fan Joe Ahearn, having obtained Captain Action's trademark, formed Captain Action Enterprises LLC with Ed Catto, and shortly afterwards struck a deal with Moonstone to release new Captain Action comics. The hero has a new backstory in these, so it's likely that down the line I'll split this entry into Captain Action's different incarnations - the quick change artist toy, the DC hero empowered by ancient gods, the Action Force member, the Karl Arts character, and the Moonstone version.